Information regarding Summer Camps and Theatre for Young Audiences programing coming soon. It’s really time to make plans to see Really Rosie on one of the following dates! July 27th (Saturday), July 31st (Wednesday), or August 3 (Saturday)! We will be having two camps this year! 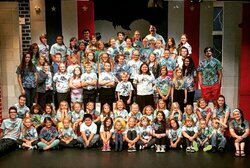 This years camps will be held at the Mullany Theatre on the Pangaea International Academy (Ashford University) campus. Please fill out the flier bellow and send it in! We look forward to having your lovely littles join us! Interested in joining our exciting teen company? Email Casting Director, Kris Doss, at krisjdoss@hotmail.com to schedule an audition and request an application. Auditions take place February 2-3 at Dancemakers in Clinton, Iowa. Auditioneers are asked to prepare a minute long monologue and a 32 bar musical selection. Deckhands candidates must be a part of the dance call. To download an application, CLICK HERE. The Clinton Area Showboat Theatre SHOWBOAT DECKHANDS program is a summer long opportunity for high school students interested in theatre to participate in all areas of the professional theatre company. Work behind the scenes in the shops. Each intern will have the opportunity to work alongside and learn from our technical professionals in an area of their choosing. This is a chance for young theatre artists to expand their knowledge of theatre in a different direction. Make friends and connections that will last a lifetime!